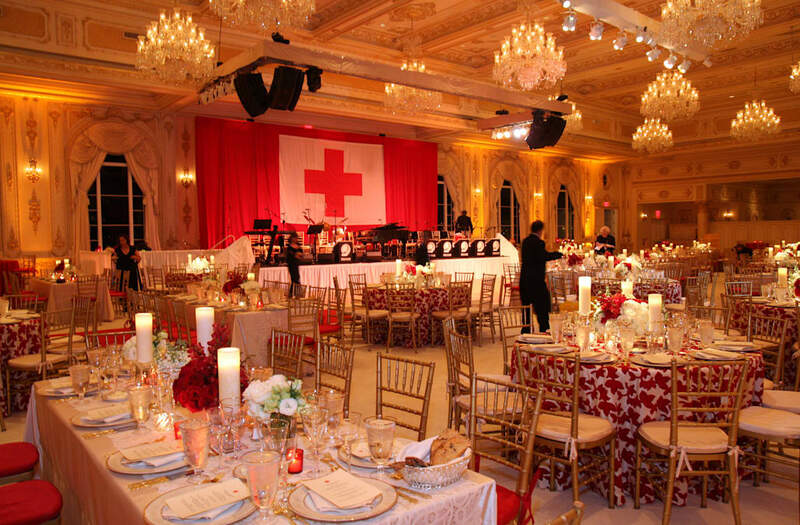 President Trump is scheduled to go to the Mar-a-Lago Club in Florida to attend the annual International Red Cross Ball this weekend. Despite the Trump family owning properties around the world, the Palm Beach resort has a special place in the businessman-turned-politican's heart. For over 20 years, Trump and his family have spent Thanksgiving in the ornately decorated dining hall. Trump's third wedding to Melania Knuss was held at the ocean-side estate, as well as the weddings of his sons, Donald Jr. and Eric. His mother's meatloaf recipe is even on the menu. Mar-a-Lago began as the personal property of Marjorie Merriweather Post, heiress of what would eventually become General Mills, Inc. She finished construction on the waterfront Palm Beach mansion in 1927 for $8 million. The U.S. Department of the Interior designated the 17-acre property as a historic site in 1969. The land's public ties continued upon Post's death in 1973, when she willed it to the Federal Government to be used as a retreat for presidents and diplomats. According to Time Magazine, Congress was reluctant to maintain Mar-a-Lago at a $1 million per year upkeep and let it fall into disrepair. The government gave the property back to the Post Foundation, who subsequently sold it to Donald Trump in 1985. Trump's purchase was riddled in controversy. His original offer of $28 million was rejected so he bought the beachfront directly in front of the property and threatened to build a wall to wreck Mar-a-Lago's views and value. The price kept falling until Trump was able to buy it for a mere $8 million, including Post's antiques and furniture. Trump used it as his private residence for 10 years, until April 1995 when he established it as The Mar-a-Lago Club. The 'Winter White House' is now open to members with deep pockets. The initiation fee doubled on January 1, 2017, the same month as Trump's inauguration, to $200,000 and members are expected to pay $14,000 in annual dues and an additional $2,000 on food at the club. So, what do the select 500 members of Mar-a-Lago receive for the steep price? According to the Mar-a-Lago Club's website, "formal and casual dining areas, the Trump Spa and Salon, the pool, the Beach Club, breathtaking guest rooms and exclusive suites, a state-of the-art-fitness center, award winning tennis courts, beautiful croquet lawns and an entertainment series which hosts internationally world-renowned talent." Ten minutes from the Mar-a-Lago club is the International Golf Club-West Palm Beach, one of the top golf courses in eastern Florida. Trump reportedly earned $15.6 million from Mar-a-Lago in 2014, according to financial disclosures filed prior to the start of his presidential campaign. While member fees do contribute to this number, the club also serves a secondary purpose as a event venue. Parties can be held outside by the pool, or in one of two ballrooms, including the Donald J. Trump Grand Ballroom, which has been coated in $7 million worth of gold leaf. Or if you simply want a glimpse of Trump's Floridian life without fully committing, keep your eyes peeled for the Palm Beach social calendar. #throwbackthursday pic with Vanessa somewhere along the campaign trail during the primaries. ...magical night at The Morgan Library celebrating the engagement of @claire_fivestory + Michael Olshan. Congratulations to the sweet, charming and generally perfect couple! Wishing a very happy birthday to my father-in-law @realdonaldtrump today - Cheers to the best year yet! A great long weekend spent with the people I love most in this world.